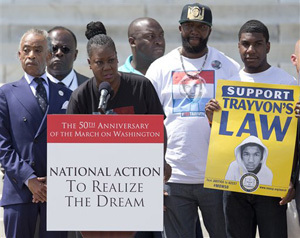 WASHINGTON (AP) - Former Secretary of State Colin Powell called the jury verdict that cleared the killer of Florida teenager Trayvon Martin "questionable" and urged President Barack Obama to speak more on issues of race during an interview that aired Sunday. The first black chairman of the Joint Chiefs of Staff said the Martin verdict soon would be forgotten but said Obama - and all presidents - have a responsibility to discuss the nation's history of racial injustice. Powell spoke as Washington marked the 50th anniversary of Martin Luther King Jr.'s march that included the iconic "I Have a Dream" speech.